A 90-minute motorbike ride on one of the most horrendous roads I’ve ever ridden on took me from Rubuguri to Kisoro and a meeting with a wonderful guy called Denis Agaba. He works for GAFI – the Great Apes Film Initiative – a UK-based organisation which is pioneering something called “pedal power cinema”. Denis showed me the kit – it’s amazingly simple. Any pedal bike (adult or child’s) can be bolted to a special frame, then pedalled while stationary to power a dynamo connected to a DVD player/projector set-up. This ingenious little kit means you can screen films in the most remote areas of the world where there’s no access to electricity. 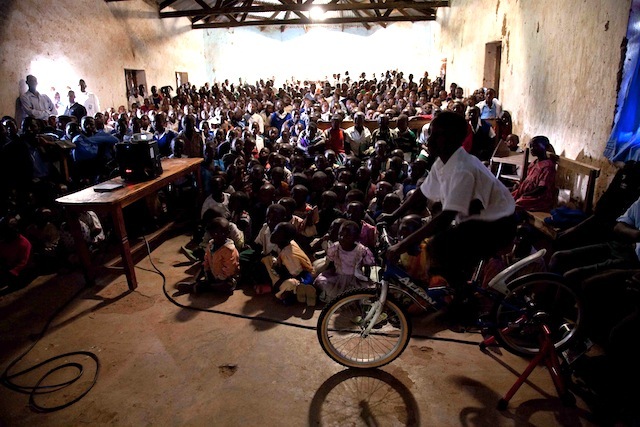 Pedal power cinema – it really works! Denis is using the kit to educate kids here in Africa about the importance of conservation and wildlife, and specifically about the population of mountain gorillas that this part of SW Uganda is famous for. Tourists pay up to $550 for a gorilla tracking permit – but most locals can’t afford this so they’ve never even seen the gorillas, let alone understand why it’s important to protect them. Denis is clearly passionate about his work – and good at it too! I’m really hoping Film Africa can partner in some way with GAFI to get access to the pedal power gear and help Denis with his fantastic activities. Fittingly, the journey back from the meeting was also full of bike action. There’d been a downpour while we were inside and the un-paved road back to Rubuguri was washed out with sluices of thick mud, making it hard to see treacherous rocks buried underneath. After one especially horrible bump, the front wheel started thudding as if it were now square – a puncture! 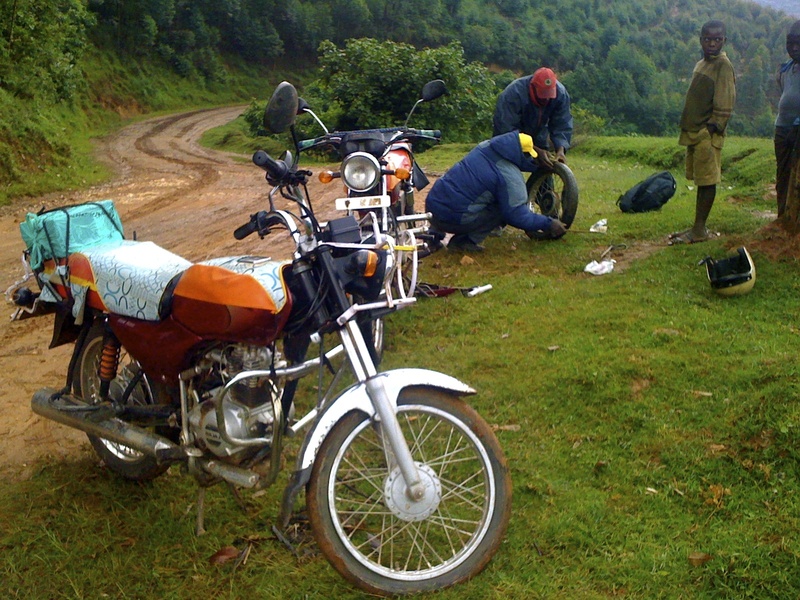 Halfway up a steep mountain valley, apparently deserted, it wasn’t long before help arrived – of course, this is Africa! Just round the next bend, a couple of guys were fixing a puncture on their own bike and were more than happy to lend a hand with mine! With the usual African ingenuity and limited tools, the men set about the task and had me back on the road in no time – and just before dark, I arrived back at Film Africa HQ, mud-spattered, rain-soaked… but very happy! 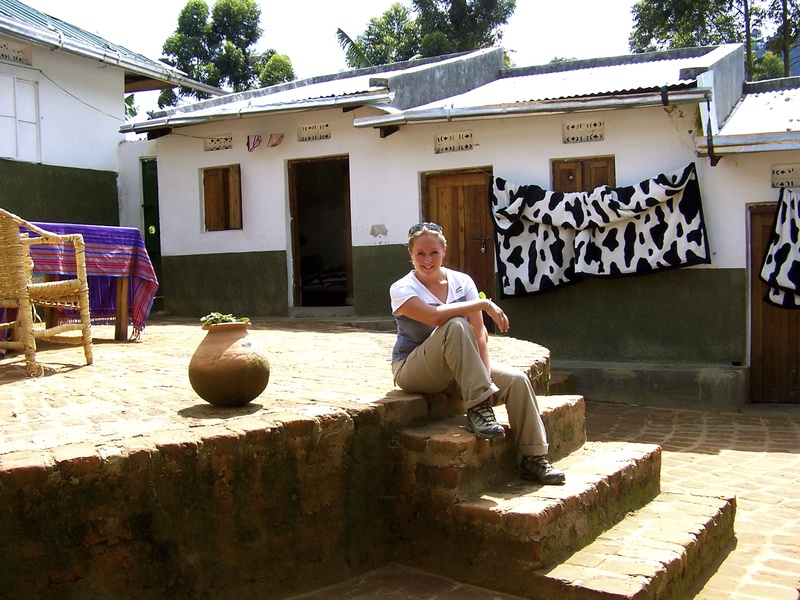 This entry was posted in Adventure Travel on October 29, 2013 by Jeanie Davison.